Here's a bunch of photographers surrounding the 2015 Cadillac ATS Coupe at the Detroit auto show. While they were taking pictures, I asked one of Caddy's top execs if an ATS-V was in the works. The short answer: Stay tuned. Ulwe Ellinghaus is Cadillac's newest head of marketing and spent more than 10 years at BMW, so he'd be a good guy to ask about luxury brand proliferation. 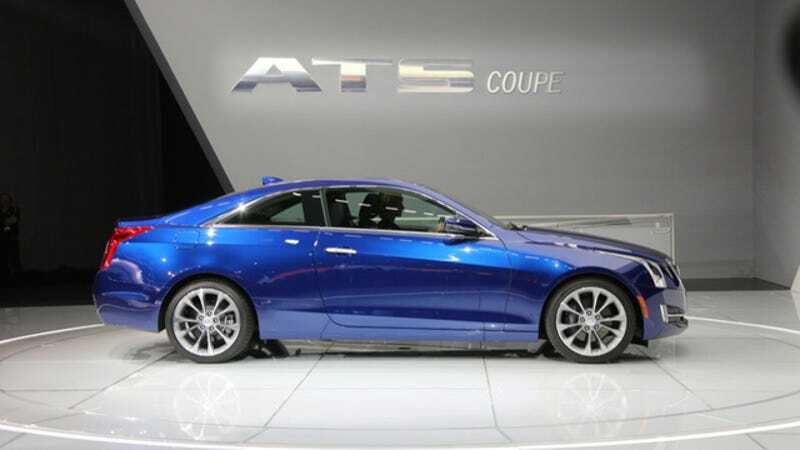 It makes to have some kind of ATS-V since there's a CTS-V and XTS Vsport. Ellinghaus didn't say no, which means yes there will be an ATS-V. "Expect us to leverage the tremendous success that we have had with this letter V also on further models. Customer appreciation is high for them," he says. I asked Ellinghaus if there would be an ATS wagon or convertible after reading about it in Automotive News, and it doesn't sound like everyone at Cadillac is on the same page with that. While Cadillac's global chief Bob Ferguson says it's on the table, Ellinghaus says Cadillac "shouldn't go too far in this direction." "Do not expect us to have a similar complex lineup like some of our European competitors," he says. "I start to get lost with the number of body sizes, engine types, variants...It has to be only in line with building the brand image." Also, good news for all you SRX fans! (We know there's a bunch of you since that's Cadillac's best-selling model.) Ellinghaus says the SRX won't be refreshed anytime soon because people are content with the same design that's been there for the last few years. Your move, Lincoln MKC.